Nearly all of the water is located in the lowest layer of the atmosphere, the troposphere. Water is present in variable amounts in the atmosphere, from 0 % to 4 %. Unlike oxygen and nitrogen, the concentration of oxygen depends on local weather conditions and changes greatly from place to place on Earth. Clouds form preferentially over dark vegetation and just downwind of mountain ranges. The water in the atmosphere makes up only a very small percentage of the total water on Earth. In the atmosphere, water exists as a gas (water vapor from evaporation), as a liquid (droplets of rain and liquid water that coats solid particles), and as a solid (snow and ice). Its structure depends on its state. 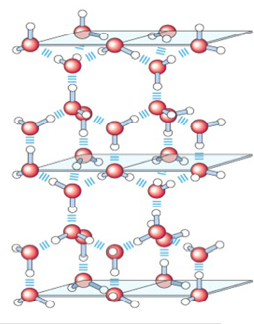 Water in the gas phase has a bent structure with an H-O-H angle of 104.5 degrees. 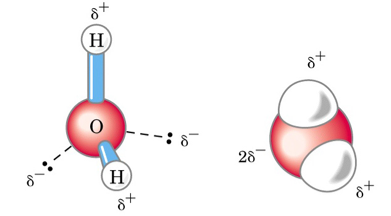 In the liquid and solid forms, there are bonds between the hydrogen atoms of one molecule of H2O and oxygen atoms of other molecules. This gives a 3-dimensional structure in which each oxygen atom is surrounded by a tetrahedral array of 4 hydrogen atoms. Clouds and fog are not gas-phase water. These consist of particles of liquid and solid water that reflect approximately 20 percent of the incoming solar radiation in the troposphere. This makes the atmosphere and the Earth's surface cooler than it would be otherwise. Humidity is the concentration of water in the gas phase that is present in air. In central Illinois summertime, the humidity is very high! Gas concentration relates the amount of gas molecules in a volume. The amount of gas can be expressed in molecules, moles, or grams. The volume can be in liters, cubic meters, or cubic centimeters. Molar concentration is the number of moles per liter (mol/L or M). Imagine that you put some water in an empty container and seal it. After a while, some of the water will evaporate. Water will continually evaporate and condense but, after a while, the net amount of water in the gas phase will remain constant. 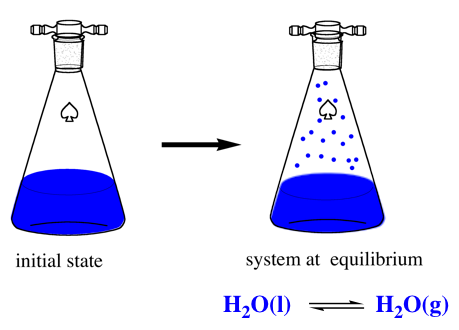 The water(g)-water(l) system is at equilibrium. The concentration of the water in the gas phase depends on temperature and pressure. Heating the water from room temperature (~20 deg C) to 70 deg C will cause the amount of water in the gas phase to increase to a higher but constant amount. Decreasing the temperature to 5 deg C will cause some water vapor to condense until a new, lower constant concentration is reached. Adding air to the container to increase the pressure will cause some water vapor to condense until a new, lower constant concentration of water(g) is reached. The troposphere is like a very large container. It can take a long time for the equilibrium condition to become established, but the maximum amount of water(g) present in the will depend on temperature and pressure. The relative humidity is the ratio of the actual water vapor pressure to the saturation water vapor pressure (equilibrium value) at the prevailing temperature and is expressed as a percentage. 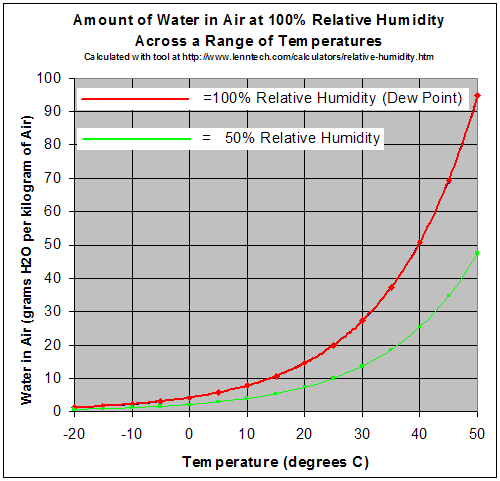 At 100% relative humidity, the water(l)-water(g) system is at equilibrium. The dew point is the temperature to which the air must be cooled before water condenses from it. Note that the values in the graph at right are not true concentration values but relate the mass of water per mass of all gas molecules.